Last summer I lamented that one of the saddest things about the 2011 riots in London, Birmingham and Manchester (and also in Tiverton, where someone threw a scone at a park ranger's Land Rover) is that there was almost no chance at all that we'd get any good pop music out of it. There's no future for our ears, to paraphrase Mr. J. Rotten. I remembered this today as I was listening to a song inspired by a riot which took place over 40 years ago. But the song - and the riot - was a lot better than anything we have nowadays. So, feeling inspired and too tired to do a riot, I thought I would instead share five of my favourite popular songs inspired by social unrest with you. Any riots which begin as a result are entirely your own responsibility. Frank Zappa wrote Trouble Every Day in Echo Park, LA during the Watts Riots. It's a song that has stood the test of time particularly well, largely I think because its focus on sensationalist news coverage makes it peculiarly modern in its outlook - as if Charlie Brooker sang the blues. Also touching on themes of racial politics, social inequality and injustice, it is one of the more eloquent songs about the confused chaos of 1960s America. Rioting was all the rage in America in the late 1960s, one of the most tumultuous decades in its history. Isaac Hayes and David Porter's song, whilst not dealing explicitly with themes of social unrest, is perhaps the most interesting in this list from a political standpoint. At the time, black militant groups were growing in size, power and influence. They were as mad as hell and not going to take it any more. Hayes and Porter themselves were both born and raised in Tennessee - also home of Stax Records - and had witnessed segregation first hand all through their lives. During TV coverage of the Detroit Riot of 1967, Hayes noticed that black people wanting their homes and businesses spared from being burnt or looted painted the word "soul" on the door as a gesture of solidarity. Soul Man, therefore, is a song about black solidarity and pride and honkies can all just get bent. Although they presumably didn't tell Steve Cropper this before he played guitar on the song, even getting a mention in the vocals. POP FACT: Isaac Hayes couldn't read or write music (he is perhaps the only Academy Award-winning composer not to be able to) so he would orchestrate all the horn and string parts in his songs by humming the required tune. Along with Hayes and Porter and Sam and Dave, Jimi Hendrix is the only other black artist to appear in this list, perhaps surprising considering that four of the five riots that inspired these songs were race-related. However, it must be remembered that Jimi Hendrix was something of an Anglophile at this point - he'd just spend two years living in the UK and making it big in England before being exported back to the USA, just like The Muppet Show - so he could perhaps have been forgiven for being somewhat taken aback on his return home. Despite last summer's shenanigans, riots are a fairly un-British thing to do. This is a country where political leaders are not assassinated but instead have eggs thrown at them. House Burning Down is a song of shock and sadness at the state of affairs: "why do you have to burn your brother's house down?". It's a good question, let's be honest. This is probably my favourite in the list, although not as a song. 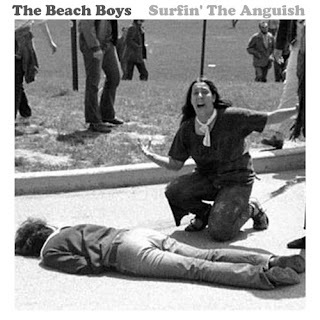 The Beach Boys are one of my all-time favourite bands but also they are possibly the least likely group ever to make a song about social strife. Indeed, Brian Wilson always hated it, saying it doesn't sound like a Beach Boys song. It doesn't really, but at the same time it couldn't be by anybody else. What can I say, the incongruity of it all delights me. The 1960s had taken a very serious toll on Brian Wilson's mental well-being, so all of the other members of the group were finally now able to stick their two-penn'orth in. Where Dennis and Carl Wilson's songs tended to be notably similar to their elder brother's, Al Jardine kept it folk and Bruce Johnstone specialised in whimsy, Mike Love tended to go LOUD. 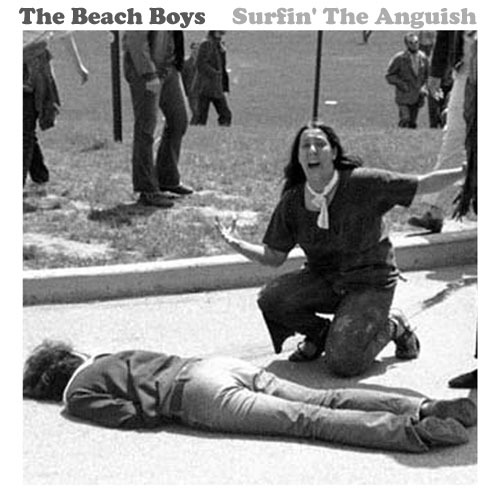 And what could be louder than The Beach Boys singing about the National Guard shooting four students for protesting about Vietnam, social injustice and anything else you've got? You know what students are like. Punk rock being a straightforward sort of music, this song is very straightforwardly about a riot. The word riot is even in the title, look. But as with many of Joe Strummer's songs, it's deceptively thoughtful and meditative. I always felt that The Clash's first album should have been banded with 5 minute gaps after each track, to serve as contemplation time. As Strummer later pointed out, this is a song about being involved in a riot that, as a white man, "wasn't our riot". The song touches on social unrest, injustice and racial inequality, all in one minute and 57 seconds and features (on the album version at least) a "1-2-3-4" introduction. This is my favourite one of the songs on this list. By miles. And I really like Trouble Every Day. A lot. It made me want a riot of my own. In fact, I'm having one right now. In my pants. Last sentence = FRIED GOLD ... you are truly inspiring. This is exactly the sort of thing I dream of one day writing on my top five blog. Hat taken off and waved jauntily at you in appreciation of such excellent prose.